Conventional, 21st century wisdom says that content wants to be free. That content isn’t worth paying for. That “exposure” in exchange for content is sufficient reward. Funny thing is that those who try to sell you this line don’t have content. And not only do they want yours free, but they want to profit off of it as well. Though the exploitative nature of this kind of arrangement should leap out at anyone, the word “exposure” blinds most people from an objective assessment of a one-sided, losing proposition. But now, in the wake of AOL’s $315 million acquisition of the Huffington Post, its corps of 9000 uncompensated bloggers, including Molly Secours are realizing that they’ve been had. Some, like Secours, are simply cutting their ties, while others, like one blogger on the Hey Arianna Facebook Page is trying to determine whether there’s any legal basis for a lawsuit for retroactive compensation in recognition of how the bloggers’ collective efforts contributed to the success of the site. Now, I don’t sympathize with the HuffPo bloggers – they’re grown ups, and those who dutifully posted content at someone else’s site, week after week without any compensation should have known better. At the same time, I know that these are desperate times, and as Jane Genova points out at Law and More , there are hoards of unemployed lawyers willing to work for free on the slender hope that they’ll be rewarded with a paying job. Below are some questions that should help you to distinguish between strategic, uncompensated use of your talent on the one hand, and sheer exploitation on the other. 1. Is it that they can’t pay…or they won’t? To me, this is the most significant question. If you’re offered an uncompensated position – either as a law clerk in a law office or as a regular blogger or columnist for a publication – ask the person who’s hiring you why there’s no pay involved. Perhaps the lawyer is working on a pro bono matter and isn’t being paid either, or perhaps the publication you’ve been asked to write for is a labor of love that doesn’t generate any revenue. Though lack of compensation isn’t ideal, at least you won’t be taken advantage of in this type of situation. Likewise, if a lawyer offers to mentor you in exchange for a few hours of assistance each week, and doesn’t bill your time, that’s a fair deal as well because you’re getting value in exchange. By contrast, in some situations, a lawyer may have you work for free claiming that he can’t afford it, and then bill your time at $200/hr. Or a publication may generate revenue from ads and subscription services but nonetheless, offer you “exposure” rather than cash. In these situations, it’s not that these companies can’t pay, but rather that they won’t. Here, you have two alternatives. First, if you’re somewhat interested in the opportunity, insist on some payment – even a small amount like twenty or thirty dollars for an article or a revenue share, or a promise of deferred payment from the lawyer (documented by a formal contract). At least this way, your future employer has some skin in the game. If the prospect won’t even agree to those terms, then you need to ask yourself why you’d be willing to work for someone who won’t pay. After all, if they can afford to pay you and they won’t, then maybe, they’re just not that into you. And if that’s the case, they’re certainly not going to hire you or even be of much assistance in helping you find a paying job. 2. If they can’t pay, or will pay something, what benefit will you derive from the arrangement? OK, so let’s assume that the potential employer either can’t pay or is willing to at least make a good faith effort at some compensation. Is the opportunity worth it? Will you learn a new skill or get your foot in the door in a cutting edge area or be identified as a co-author on an article that will appear in a prestigious publication? Will you have an opportunity to learn first-hand from the best family law or criminal law or [fill in a specialty] attorney in your neck of the woods? By contrast, if you’re going to be shuffling papers in a back office or writing posts that only five people read, the position simply may not be worth your time. 3. How much work is involved? Of course, most lawyers give away some amount of work for free, even where others are paid for it. 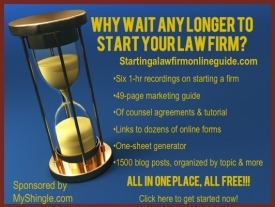 Most lawyers will write an article every so often for a bar magazine or AmLaw 100 publication, or an op-ed piece for a newspaper or speak at a conference for no charge. In many of these cases, the newspaper or the conferences generate revenue even though they might not compensate you for your services. Still, these cases are distinguishable because they don’t rely on your work product for their revenue. In contrast to Huffington Post, which depended exclusively at the beginning on user-generated content (it did start paying some writers down the line), most of these publications would survive without contributions from readers. Moreover, writing a couple of articles here and there for no charge doesn’t pose an opportunity cost in the way that providing content or working free on a regular basis is. 4. Are you doing the work for yourself? Of course, most bloggers don’t get paid – so you may wonder why I’m so adamantly opposed to working for free when I’ve been blogging largely uncompensated for eight years (though this site has been monetized a little bit since 2008 which is why I pay regular writers and am reluctant to accept guest posts because I can’t pay everyone). Well, actually, blogging does pay – only you make an investment in yourself and your practice by staying current on emerging areas of law, improving your writing skills and building a reputation. When you work free for others, you’re giving the value of your investment to them. Would you rather do the work and not get paid? Or NOT do the work and NOT get paid. If you get paid, I get paid. Maybe that’s an old-fashioned sentiment in a free-wheeling, crowdsourcing kind of world. But then again, so is freeloading.